VICIOUS vikings recently invaded a Kenilworth school. 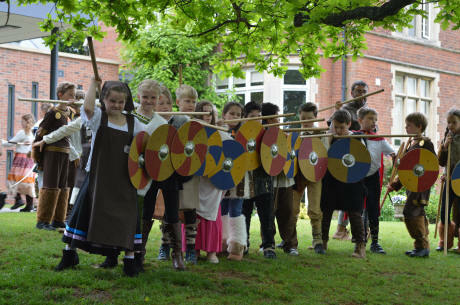 Youngsters at Crackley Hall left modern day Britain behind for the world of Norsemen. Children and staff came to school in viking costumes, took viking names and spent the whole day finding out about life for the famed warriors. Pupils also got crafty with some candle, rope and jewellery making, as well as producing their own ink, and concocting viking medicines. The children also trained as warriors, to protect the village from the invading Anglo Saxons, and learned about viking discipline and organisation in battle before putting their knowledge into practice complete with armour and viking swords.